The final release of IE9 "hit the stores" (just download it free from here - http://http://www.beautyoftheweb.com//). Enjoy new features like pinning, jump lists, and aero-snap. 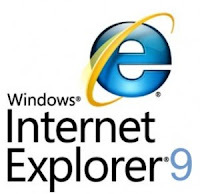 Of course, IE9 is also focused on standards, so you can now get the best of HTML version 5 in IE9. By the way, if you're using IE6 - you might want to check out http://www.theie6countdown.com/ and http://www.ie6death.com/.